A Fun Casino is uniquely positioned to make it perfect for Charity and Fundraising Events. It offers great entertainment whilst raising money for your chosen cause. A Charity Fun Casino is a legitimate way of generating funds for any cause at any event, with a proven track record. 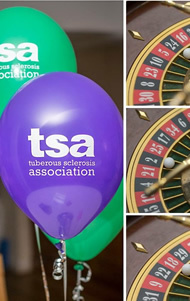 The casino tables create an entertaining atmosphere and generate excitement providing charities with an opportunity to raise substantial sums for their worthy cause. We supply you with fun money ( which can be personalised at a cost ) which you can sell to your guests to exchange for fun casino chips at the tables. The amount you charge is entirely up to you. Players with the most chips at the end of the evening usually win prizes (often donated through sponsorship), although the quality of the prize(s) is often far less important than the opportunity to participate and enjoy being entertained by our friendly, professional croupiers.